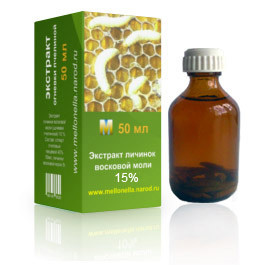 PREMIUM quality – thoroughly prepared tincture of wax moth. The possessed knowledge backed by more than 40year experience in beekeeping and strict adherence to technology and work hygiene ensure the highest quality of this product. The tincture of wax moth is prepared by an ancestral beekeeper Volodymyr Stefanyshyn, who makes the tincture of wax moth since 2008 and has cured already many patients from severe forms of tuberculosis and other illnesses. How can tincture of wax moth fight mycobacterium tuberculosis and other pulmonary diseases? Wax moth (mellonella) is used for the preparation of many pharmaceutical drugs. Without checking these drugs could not get into the chemist shops. This is proof that the wax moth has a therapeutic effect on the human body. Therapeutic effect of wax moth tinkture was confirmed in practice by Russian scientist and Nobel laureate Mechnikov I.I. and doctor Mukhin S.A, who cured himself from tuberculosis using tinkture of wax moth. Mechnikov I.I. proposed scientific hypothesis that many pathogenic viruses and bacteria have a protective shell, which in its properties resembles wax that is resistant to chemical attack. Digestive enzymes of wax moth break down wax, which is food for it. A similar effect are disease-causing viruses and bacteria exposed to as well. As a result – they become harmless. - stability during storage (can be stored up to five years).